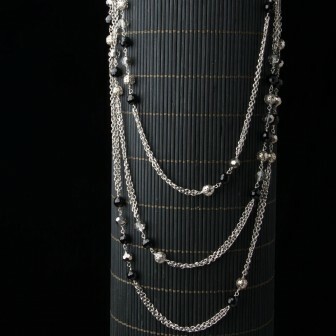 This stunning black onyx bead necklace is strung on shiny sterling silver with traditional silver Bali and glass beads. It is really an eye catcher. The sterling chain on this necklace is gorgeous! At a continuous length of 103″ it can be worn long or doubled over for a layered look. Matched with our onyx earrings, your statement is complete!